Eight temples in one day gets a tad tedious. Actually there are a few minor temple variations: one or two temples are actually built of red brick rather than stone( maybe the mountain had already been used up? 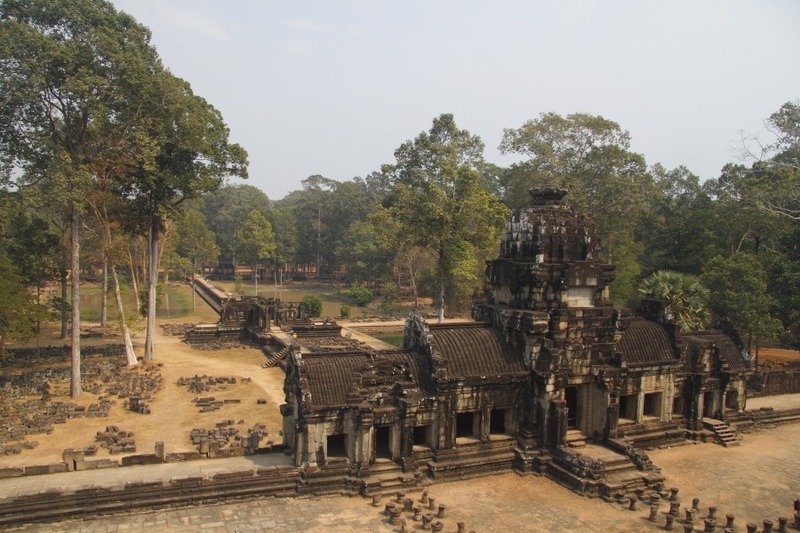 ); some temples are Buddhist, some are Hindu and some have been both as the Cambodia’s religion changed with that of the head honcho; some temples, including Ta Phrom where Lara Croft did a bit of well-publicized tomb-raiding, are covered in tree roots as the forest regains control whilst other temples remain forest free. Essentially, though, all these temples are similar piles of old stone to a heathen such as myself. 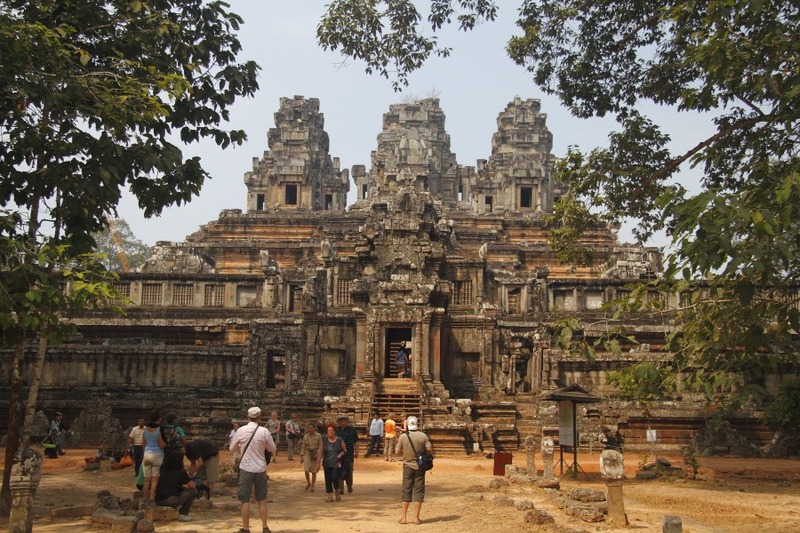 There is another notable distinguishing factor between temples: some are swamped by tourists while others remain relatively tourist free. 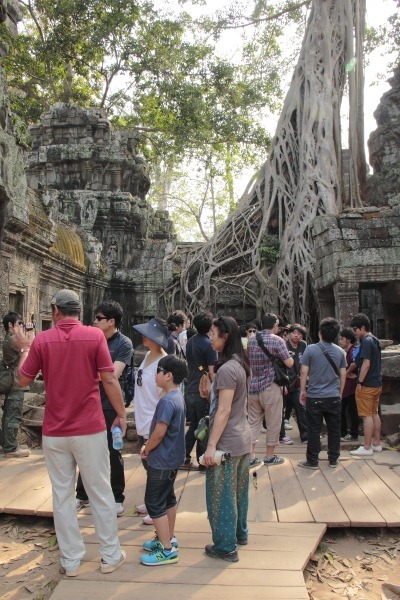 Being famous for Tomb Raider, Ta Phrom is sinking under the weight of thousands upon thousands of tourist feet. One carved head at Bayon features in the Lonely Planet guide so all the bozo tourists simply have to have their picture taken standing before it. Personally I’ve never understood this behaviour but it takes all sorts. 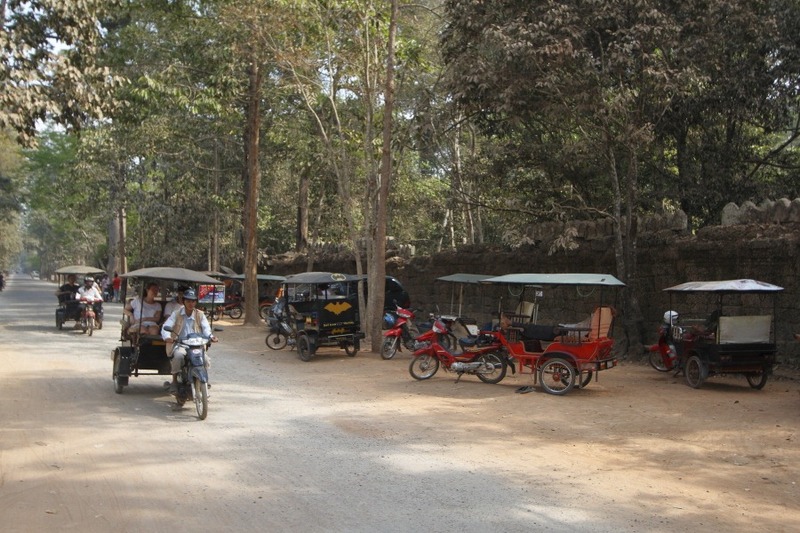 The favoured mode of transport to get the majority of tourists to this plethora of temples is the remork-moto, a chariot pulled by a small motorbike and almost always referred to(incorrectly) as a tuk tuk after the similar mode of transport popular in Thailand. After a long day in the heat trekking through in and around eight temples made them pretty much merged together and I can’t remember all the names but a post such as this would be incomplete without a smattering of photos depicting some of them, so here’s a couple of the more picturesque ones with as many tourists as possible omitted. The area is not all piles of old stone, however, there is interesting life here also. At the temple above right we watched a local man fishing in a modestly sized pond. 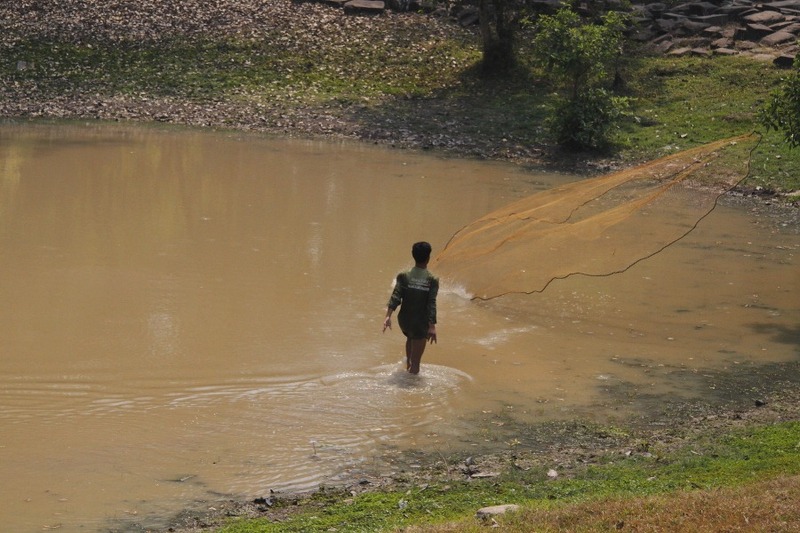 He would stand still watching for fish, then skilfully cast his circular net which had been draped over his arm in folds. There was also something for us Odo-nutters as we found a beautiful new (to us) dragonfly living in what had been an old swimming pool. 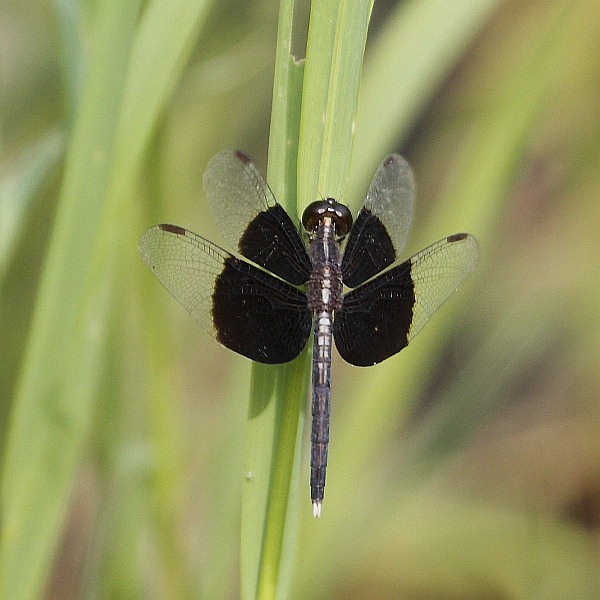 Don’t quote me but I believe this guy is a so-called Pied Percher (Neurothemis tullia). Boy did the first beer go down well … and fast. The second one didn’t last a lot longer. To replace the calories we’d used up doing templeville, in the evening we wandered downtown and shared a meal for two billed as a “Khmer Curry Set”, which consisted a mixture of four curries with rice all served in banana leaves (stapled together). That went down very well, too.